Inspecting Floor. Do not expect site-finished wood floors to resemble fine furniture. Some irregularities may be present, but they should not be prominent. For ex¬ample, some sanding scratches are acceptable in particularly hard woods such as Brazilian cherry, hickory, or maple. The same is true of soft woods such as pine or fir. What’s acceptable in a refinished floor depends on the condition of the floor beforehand. Some conditions may be difficult or impossible to bring to a like-new state. The owner will have to balance the existence of defects such as stains against the cost of replacing the boards or the floor. Contractors need to be upfront with clients about such concerns so that no one is surprised. 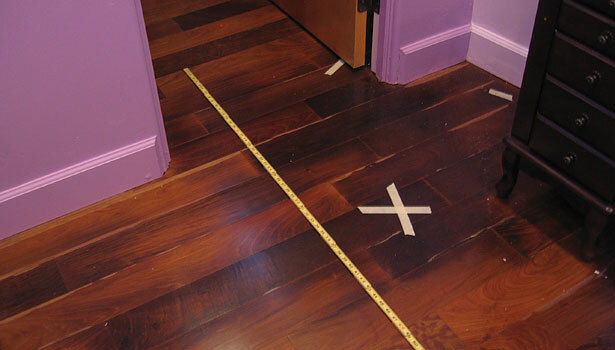 When inspecting an existing wood floor for imperfections, do it from a standing position under normal ambient lighting. According to the standards of the National Wood Flooring Association, imperfections visible only in the glare from large windows do not count. The glare magnifies any irregularity in the floors. Both extremely light and extremely dark finishes may also accentuate irregularities. If these irregularities wouldn’t be noticeable in a medium brown floor, they are not considered defects. Our commitment to service is unparalleled in the flooring industry. We guarantee an immediate and direct response to our customers’ inquiries. We work with customers to understand their needs and develop a plan to meet those needs. We are fully insured for flooring projects. We develop long term relationships with our clients by providing outstanding service and superb workmanship. Our success is the result of providing outstanding service and always using top quality products. Our number one goal is your complete satisfaction.